Starbucks' logo change was the most recent test to its CCO's storytelling acumen, a skill honed while working at Nike and writing about rock stars. Starbucks CCO Corey duBrowa learned from communications roles at Nike and Waggener Edstrom that the secret behind changing an iconic logo, sans angry consumers, is storytelling, a gift immediately acknowledged by various former colleagues. Leading up to the company's 40th anniversary in April, as well as the removal of the Starbucks name from its logo design, duBrowa worked with CEO Howard Schultz on a three-and-a-half-minute Web video to openly discuss Starbucks' business ambitions and the rationale behind the brand and logo evolution. Prior to the unveiling, he worked with the marketing team to hold forums aimed at partners, core customers, and the design community. "From research around similar logo challenges, we determined the business rationale behind the changes wasn't explained very well, if at all," explains duBrowa. "We needed to get input, so we had internal and external measures to gauge what partners thought." The story at the heart of the Web video is that Starbucks is in the midst of a transformation from a coffee company to a global CPG food and beverage organization that houses Tazo teas, food products such as ice cream, and a new single-serve product via a Keurig partnership. Having severed its grocery distribution partnership with Kraft, it's free to market and promote products, such as Via and Natural Fusions, on its own. The company is entering new global markets with product and communication guns fully loaded. "At retail distribution in our share of market, even in our most developed markets here in North America, we still have less than 10% share. A lot of the job at this point is simply building awareness of the fact that products are available at the grocery," says duBrowa. DuBrowa and his team are promoting the early days of the company's grocery push. For example, a couple of years ago the marketing and PR teams collected data by testing the instant Via product at retail and within licensed stores at grocery outlets. The teams then translated results into marketing that included national tours, media relations, and messaging toward the disassociation of instant coffee with a negative perception. Though planning for this effort began before he joined Starbucks in early 2010, he says the store-within-a-store strategy will continue to serve as a key promotional approach. "By taking back our brand from Kraft as of March 1," duBrowa explains, "we give ourselves a very different way to directly communicate with the retail channel and potential customers, and create awareness and foster the kind of loyalty we see in our stores." His goals have also remained consistent with regard to innovation in measurement, in part through a deeper relationship with longtime AOR Edelman, as well as internal communication to generate better cross-discipline research and campaigns. "The PR industry still struggles with how to connect what we do with driving sales," adds duBrowa. "I said, 'I want us to look at measurement in a different way.'" He explains that it was about understanding where reach connotes not only awareness, but also authority. The approach is in line with programs for established products, such as Frappuccino, that can help bridge the gap between retail and grocery and speak "consistently to consumers across all the different channels," says duBrowa. Research indicated that the brand should be targeting an influential younger consumer, and duBrowa's team, in association with marketing, is doing so through boosted alignment via advertising, social media, and sponsorship at events such as Fashion Week. He has also tried to replicate this consistency model across international regions, as the company looks for new ways to communicate and expand its retail and grocery offerings in 55 countries and beyond. "When we establish a news agenda, it's not just a US-based agenda. It's a global agenda," duBrowa emphasizes. "Early on, I suggested we had underinvested in our global communications." The search for consistency is also evident in the recent evolution of certain senior-level executives' roles. Christina McPherson, head of executive and international communications, now focuses wholly on her international responsibilities. In addition, the role of Lara Wyss, director of global PR across retail and CPG brands, has been updated to where she now focuses more on the CPG side of the business. DuBrowa is also positioning his communications resources for access to markets ripe for expansion, such as India and China's secondary and tertiary cities. But building global communication and consistency was no simple task, especially at the start of duBrowa's tenure just following a time when the company cut $600 million in spending and shuttered stores, he says. The company had seen better days before its mistake of accelerated overdevelopment. That story was one of the first that came back to duBrowa when he started, and he and Schultz, who rejoined the company in 2008 as CEO, are telling it today as part of the evolving business story. For example, in 2008 Schultz took almost 10,000 store managers on a $30 million New Orleans trip, at a time when nobody was traveling, to talk about the new direction of the company. Years later, duBrowa is talking about community service surrounding that trip and how it was a turning point and a brave initiative for Schultz to undergo. "When I came on board, there was two years' worth of significant communications challenges: skepticism about our ability to grow, a fundamental hangover idea that you just shut several hundred stores and laid off many people, and people questioning whether Starbucks itself was a fad or perhaps the world's love affair with coffee had changed," he says. As a result, he and his team had to relay to the world the company's growth strategy in a way that "looks ambitious, but not overly ambitious," as well as be transparent about what it took to fix the issues. 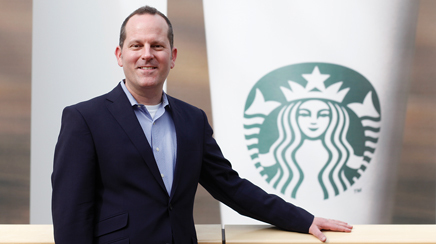 "We began looking at every discipline within Starbucks, from PR to supply chain," says Schultz. "We made a significant commitment to upgrade talent with senior leadership." He notes that duBrowa brought a strategic understanding of the business landscape and the "seismic change in consumer behavior," which duBrowa attributes to a shift toward brand loyalty. DuBrowa joined Starbucks as VP and CCO in early 2010. For a number of issues he's already had to deal with at the company, including store closings, the Kraft separation, and the recent logo redesign, he drew upon past experience. As director of internal communications at Nike, he worked on labor engagement issues and a similar logo challenge when the swoosh separated from the word Nike. Also, as North America president of Waggener Edstrom, he supported communications around corporate and legal issues for Microsoft. Microsoft VP of communications Frank Shaw, who worked with duBrowa at WE, says duBrowa helped Microsoft crystallize its corporate image in the mid-2000s. "Corey is one of the most natural storytellers I've ever met," he adds. "It was a great feat when he was at Waggener Edstrom, and I see the impact at Starbucks." Today, duBrowa continues to tell Starbucks' 40-year story through a campaign that involved dedicating the entire month of April to global community service and leveraging corporate leadership through promotion of the launch of Schultz's new book, Onward. "We need a multiple-program strategy with regard to the brand's equity and how we communicate to multiple geographies," says Schultz. "The place Starbucks is going will require a very acute understanding of the changing landscape. Corey will play a great role." Unable to sleep on airplanes during the time he was helping to expand Nike's presence in Latin and South America, duBrowa identified a passion for rock journalism. "On flights from Portland, OR, to Miami to Santiago, Chile, I needed something to keep my brain occupied," he says. A counterpart at Nike who helped with the launch of rollingstone.com connected duBrowa with the outlet, and he wrote first for the website and then the magazine. Since then, he's written almost 1,000 artist stories, including a piece on The Decemberists before they became popular, for numerous publications. "It's classic narrative storytelling," he says. "All of that is what we're charged to think about as communicators: how do you make your company human."